The only structure that is visible today of part of the castle is the Postern Gate, recovered from the castle when it was demolished and quarried during the 1860′s and built into part of the boundary wall of the station. This gate was dismantled from its original position and rebuilt along with the wall in the 19th century. The wall is also built of re-used Castle stone. Additionally, Castle Hill Meeting House is built from Castle stone. For 22 years Phillip Doddridge (1702-51) was the minister of the meeting house, which served as an independent congregation at Northampton between 1729 and 1751. The building is still in use to this day. The present Castle site can be considered as being in two parts; the larger part to the West of St Andrew’s Road and a smaller part to the East. In the 19th century the river was moved to the west and the high ground on which the then ruins of the castle stood was lowered and a terrace created that became St Andrew’s Road. The land to the East was largely left undisturbed. During the demolition, antiquarians and surveyors recorded much that was uncovered and a large quantity of finds saved that are now in Northampton Museum. 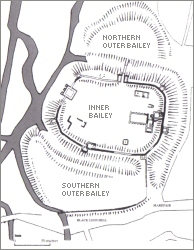 In 1961-65 archaeological excavations were carried out on part of the surviving east side. There is potentially more information to be found on the station side, particularly the earlier wooded castle and the Saxon defensive ditch, both would yield valuable information as to the ecology of the area in the past and lead to possible information on earlier human activities. The investigations in the 1960′s only investigated a portion of the existing area to the East of the St Andrew’s Road retaining wall. There are more features to be uncovered and the walls and wells exposed by the excavations are still largely buried and intact beneath the present grass. Twenty years ago there was an upstanding section of a garderobe (closet, sometimes a toilet) wall by part of the bank this has been robbed away. The information plaques have been vandalised. The garderobe itself probably still survives under the eroded material at the base of the bank. The only area listed at present is a small piece of land to the north-west corner of the St Andrew’s Road and Black Lion Hill junction. It seems that the only reason that this part was listed is because it was thought to be the only part of the original land surface on that side of the road. If the railway station were to be re-developed (as is being discussed), this would afford an opportunity to discover more of the nature and extent of the Saxon defences and in both cases, the defence ditch and the river bed could yield valuable environmental information from the silts of these periods. It is felt by FONC that more protection of what remains to the east of St Andrew’s Road is required and at least the opportunity to investigate specific areas and in general in the area to the west in event of a development of the railway station site. 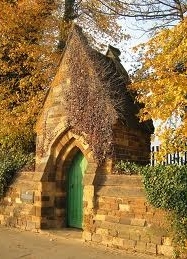 Also important would be the preservation, even if moved to a new position, of the Postern gate and associated stonework.